The CJM S0 system includes all the essentials for converting your 350z HR fuel system to a return style configuration with adjustable fuel pressure. A return fuel system with manifold pressure reference is critical for maximizing the effectiveness of your fuel pump and injectors. This system utilizes the factory fuel feed pipe to the engine bay, and the factory fuel rails. A billet 4-way fitting attaches to the fuel rail inlet tube. 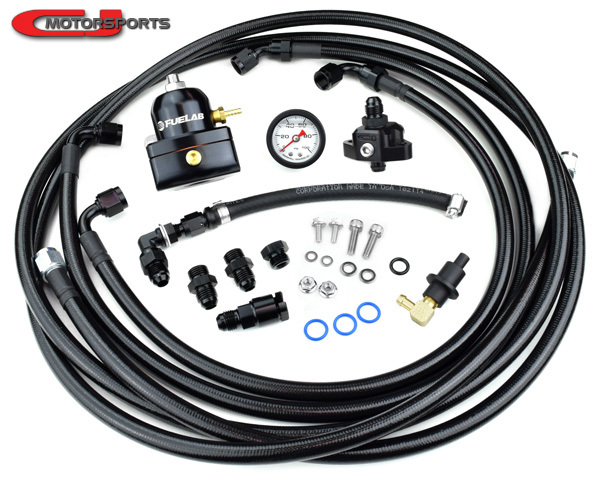 Hoses and adapters are included to connect the feed pipe to the 4-way fitting, the 4-way fitting to the regulator, and a long return line back to the fuel tank where it connects to the return correction kit. The CJM 4-way fitting acts as the fuel system hub for the engine bay. Mounted to your fuel rail inlet tube (front end of passenger side valve cover), fuel feed enters through the top and out the bottom to the rails. Out the rear is a 6AN fitting to bring bypass fuel to the regulator. The front of the 4-way fitting has a NPT port for an optional pressure gauge or sensor. The return correction kit is used to convert the factory fuel pump module to accept return fuel while maintaining integration of the 2 built-in venturi pumps. The return line connects to the bulkhead and passes through the regulator delete fitting, sending regulator bypass fuel to power the venturi system as it did from the factory. Regulator Type: Fuelab 51502-1 is standard issue. For Aeromotive brand preference, choose black or red Aeromotive 13109. We have found no discernible difference in performance. The option exists for price, brand, and color preference. Mini Pressure Gauge: A small 1/8 NPT fuel pressure gauge that can be installed to either the 4-way fitting or the gauge port of the regulator. A gauge is necessary for setting fuel pressure during installation. If you do not have an electronic in-cabin pressure gauge, you will probably want to select this option. Fire Sleeve: This quality insulation for -6 hoses is highly recommended for turbo and high-heat applications. 3 feet will protect hoses in close proximity to the exhaust manifold. 6 feet will cover the entire area. Fuel Pump: If you have not upgraded your fuel pump yet, this would be the perfect time. For the 350z fuel pump housing, we recommend the Aeromotive 340 over the Walbro 450 because it is a better fit. The Walbro 450 can be installed with further modification to the fuel pump housing. Fuel Injectors: Complete the package with a set of fuel injectors. We recommend 1050cc injectors for all boosted HR applications under 700whp. Intended for 2007 - 2008 Nissan 350z. This can fit some G35 Coupes, we recommend contacting us before ordering for a G.